By 1915, Fantômas had left his mark on France and was ready to take on the rest of the world. The master villain’s mode of operation, informed by the dynamics of spread, may well count as the most significant feature of his success story. Spread—in the sense of expansion, takeover, proliferation, and mutation—can for one be made out as the Fantômas narratives’ most prominent theme: the stories, which quickly availed themselves of literary, filmic, graphic, and other carrier media, revolved around the master criminal’s phantomlike quality of being everywhere at once and his penchant for masquerade, identity theft, and ultimately replication, which prompted the impression that “not one, but a dozen Fantômas were at work” (Souvestre and Allain, Fantômas, 236). This logic of dissemination is explicitly ascribed to the workings of a sensational print culture in the very beginning of the novel series, when an indignant commentator attributes the craze around the perpetrator in a metareferential turn to “the state of mind produced in the younger generation by the newspaper press and even by literature. Criminals are given haloes and proclaimed from the house-tops” (9). Fantômas here appears like a creature born in print; later, after exchanging his carrier medium, he will be made out as an integral part of the cinematic apparatus—he is a medial phantasm. It is of importance here that this is a dream—Fantômas does not appear on his own but is conjured up by somebody else’s imagination, involuntarily, unconsciously, compellingly. And not even as a fantasy can the criminal be fixed in place or time. He is “never twice the same”—but he is always Fantômas; the serial instantiations have at least this much in common. This particular scene does not make it into the film Fantômas: A l’ombre de la guillotine (In the Shadow of the Guillotine) of 1913—but we experience a corresponding moment of hallucinatory manifestation here. The film’s last scene depicts Inspecteur Juve, Fantômas’s luckless opponent, at his desk, in despair over Fantômas’s escape which forms the ineluctable ending of this and other installments. Suddenly the figure of the villain in his characteristic outfit of cape and domino mask dissolves in, only to laugh at his persecutor and tauntingly hold out his hands to be cuffed (fig. 1). Once Juve tries to apprehend him, the figure disappears in another dissolve, proving to be a mere hallucination, a figment of Juve’s mind. But we have seen it too, and the effect of the scene rests to a considerable extent on the suggestion of Fantômas’s fantastic power to be everywhere at once (to the point of taking over other people’s identities, bodies, or minds). Fig. 1. Fantômas taunting Juve. From Fantômas I: A l’ombre de la guillotine. Here the flickering and protean figure of the novels becomes concrete and visible—although not real; and indeed the serial in general tends to abandon the novels’ ghostly logic of the “vague form” in favor of the criminal’s iconic manifestation, or rather, a whole range of iconic manifestations. In both cases, the creature’s evanescence is juxtaposed to his visibility, so that the narrative is endowed with the logic of the picture puzzle—“now you see/now you don’t,” as Tom Gunning has pointed out. The film thus also maps the novel’s prominent technique of medial self-reflection onto its own mediality, since Fantômas’s appearance and disappearance acts call to mind the flickering mode of cinematic representation in general. Indeed, the analogies between cinematic representation and the neurophysiological conundrum of the hallucination were routinely invoked in the discourse about film in the 1900s and 1910s. In line with the contemporary tendency to cross-reference cinematic mediality with perceptual disorders, Fantômas’s haunting and taunting manifestations on the screen may seem like an illustration of the medium’s darker side, signaling the cinematic apparatus’s routine unleashing of unconscious drives and desires, as it were. But we shall see that the film serial at large does not necessarily support such a reading—there are multiple ways of reading Fantômas’s hallucinatory agency, and the surrealist celebration of Fantômas’s anarchy and subversion is only one possible response (Walz, Pulp Surrealism). In several respects, Fantômas’s career needs to be seen as an integral part of a serialized mass culture of modernity, but the figure also comments on and works with this media environment, producing an intriguing and distinctive take on the cultural and medial configurations of its day through its plurimedial unfolding. The novels pry apart and totalize Fantômas’s manifold manifestations by means of what could be called “parallel seriality”—a splitting up of the narrative in numerous, disjointed but intersecting strands that do not really allow for narrative harmonization. The film serial, conversely, produces similar effects by means of its idiosyncratic use of deep focus, its tableau structure of depiction and its narrative organization of the “cependant” (meanwhile)—suggesting that everything is always there (almost) at the same time and that detection is only a question of focus and attention. We shall see that Fantômas, in spite of what has been called an aesthetics of “abstraction” pertaining to the figure, gains an amazing concreteness in these enactments—or rather, one should say, he morphs into an assortment of remarkably concrete forms and shapes, all of them struggling for simultaneous manifestation, sprawling in sheer endless iteration (Callahan, Zones of Anxiety, 62). Fantômas, both in literature and in film, embodies the contingency of modern mass culture, and I argue that the narratives around the figure aim to chart paths through the maze that is the modern experience, rehearsing their audiences in coping manners rather than pulling them into the web of terror that is laid out diegetically. Fantômas may be a figure of disorientation and subversion, but the Fantômas stories can well be read in terms of affordances of order, or—to resort to the emerging vocabulary of the day—as ventures into social optimization and self-management. There were serial formats of narration and dissemination before the nineteenth century, but the machinery of popular seriality could only come into its own by means of the infrastructure of industrial mass production, the mass entertainment market, and the transnational circuits of communication and distribution that emerged in the trans-Atlantic world during the nineteenth century and gained full swing and scope at the turn of the century. Fantômas is the self-conscious product of the early twentieth century media economy that thrived on sensational effects and hyperbolic gestures of outbidding, an economy which is not controlled by individuals but by networks with multiple—human, institutional, or technical—agents and a conglomerate of intersecting interests. The creators of Fantômas are thus not only the authors Pierre Souvestre and Marcel Allain, but a much larger “team,” or web, of producers, including the illustrator Gino Starace, who designed the colorful sensationalist covers for the book series; the publishing house Fayard, which used Fantômas as one staple element to boost its series Livre populaire, with which it had “ushered publishing in France into the mass market” in 1906, offering books at 65 centimes and with an original print run of 50,000 or 60,000; the Gaumont film studio which acquired the rights to the figure as part of its effort to gain predominance in the French and European film market over Pathé; Louis Feuillade, Gaumont’s principal director for whom the adaptation of the Fantômas material served to further hone and promote his characteristic cinematic style; the actor René Navarre who was propelled to stardom by the role of Fantômas—and the list could go on. In fact, the terminology of “production” or “manufacturing” seems more appropriate to capture the processes of Fantômas’s inception and dissemination than the artistic vocabulary of authorship and creation. After all, the novels were already churned out with industrial efficiency by the former journalists Souvestre and Allain. A contract with their publisher Fayard compelled them to produce over 300 pages a month for the duration of a year—and they ended up over-fulfilling this quota. Between 1911 and 1913, the two authors spun forth more than 12,000 printed pages. To achieve this amazing output, they had to implement a rigid plan of operation, which involved dictation on wax cylinder phonographs and secretaries who transcribed the recorded material on typewriters. Relying on technology and a system of labor division, Souvestre and Allain systematically uprooted the principles of authorial sovereignty and originality, segmenting their work into plot clusters that were later fitted together and drawing heavily on plot contrivances of the grand guignol and other sensationalist fiction. Robin Walz has pointed out that one of the most important steps in the production process was not the final revision but an earlier appointment with the illustrator Starace (Pulp Surrealism, 52–53; Artiaga and Letourneux, Fantômas!, 19–39). Indeed, images proved to be as effective as words in Fantômas’s career, which quickly took a transmedial turn, crossing over from literature to film and to graphic media (Walz, Pulp Surrealism, 53; Gunning, “A Tale of Two Prologues”). Fantômas’s filmic remediation first took the form of a five-part film serial, directed by Louis Feuillade, which exploited the literary success story, in full swing at the time, concocting spectacular scenes and ideas from the novels into a “combustible mix of visual control and narrative anarchy.” The popular novels were not so much adapted for screen as scenically raided and inflated. The serial thus not only experimented with cinematic techniques to create a sense of narrative continuity across reel breaks or to heighten suspense toward the end of an installment, but it also produced a narrative continuum of a different sort when it routinely gestured beyond its medial boundaries, calling up the plots of the popular serial novels in the cursory and sensationalist manner of a vaudeville program, as a series of acts in climactic accrual rather than a closed narrative in its own right. Simultaneously, Fantômas went transnational, quickly becoming a popular success all over Europe and later in Latin America. Before World War II, Fantômas was also well known in the United States, where the novels first came out in serial format in newspapers, then as books. The film serial opened in the United States within the year of its release in France, appearing in an irregular pattern over a period of one year. In 1916, it was then re-released in a regularized format, which apparently corresponded better with the local needs of exhibitors and audiences. In 1921, a twenty-part serial loosely based on the French novels and the Feuillade serial was produced by William Fox Films; it is now lost. Thus, Fantômas was developed serially, across different media, almost from the beginning. But the individual narrative approaches to the figure also took a serial form. The Feuillade films came out as sequels at irregular intervals. By contrast with Feuillade’s later experiments with the serial mode, such as Les vampires (1915–16) or Judex (1916), however, the individual installments of the Fantômas series held together loosely at best. There is no coherent storyline that would organize the serial as a whole, apart from the fact that two investigators keep coming across the villain while failing to detain him. There is one famous cliffhanger, at the end of the second installment, when Fantômas blows up a house with his pursuers inside; otherwise, the individual parts seem to follow the logic of the blank slate—every time we encounter the same cast of characters plus numerous others in the exact same basic situation that then branches out in a seemingly endless array of options. Still, it makes sense to address the films as a serial, since they do rely heavily on narrative modes of variation and iteration, even if they do not lend depth to their characters and clearly fail to achieve any effect of epical complexity. Like other phenomenal popular successes, Fantômas’s story cannot be reduced to one cause or trigger effect, but it is obvious that the narratives’s serial format plays an instrumental role here. In her treatment of Feuillade’s take on Fantômas, Vicki Callahan notes that in many respects, the serial lent itself to what Umberto Eco called a “sinusoidal” pattern of reading in his reflections on the feuilleton (quoted in Zones of Anxiety, 60). In sinusoidal fashion, that is in a smoothly repetitive oscillation, such serial storytelling lines up “a number of minor narratives . . . in, out, and around a broad moral schema and larger narrative event, which itself has a circuitous trajectory” (61). However, while the feuilleton tends to revolve around a family mystery or crime that will find its resolution at the end of the narrative, the Fantômas narrative does not aim at such closure. Neither romance nor detection provide a satisfactory grid for approaching theFantômasnarratives with their haphazard plot logic and shifting strategies of steering the audience into sympathetic alignment or distance (61). Callahan comes to the conclusion that it must be “the uncanny that provides the primary narrative drive” (62). She may be right to read Fantômas in the spirit of a ghost story rather than crime plot, but I do not think that the narratives’s enormous popular success and spectacular historical effect hinge exclusively on an aesthetics of “abstraction,” as does Callahan; she approaches them as an almost philosophical engagement with questions of “recognition and knowledge” (62). After all, there is one striking and very concrete element that manages and organizes the series, providing a focus and anchor: Fantômas, the character. Or, rather: Fantômas, the figure, since Callahan correctly contends that the serial generates “a diminution, and indeed almost absence, of character” (50). I associate the depletion of character and plot continuity in the Fantômas narrative at large (which goes far beyond the film serial and stretches into the 1960s and 70s) with the particular serial principle that it thrives on: the principle of the serial figure. By the time of Fantômas’s appearance on the scene of popular culture, the serial figure was firmly established as a staple element of serial narration. Dracula and Sherlock Holmes, Tarzan and Fu Manchu—all of these figures rely on the same operative system as Fantômas. Long before the advent of the comics superhero, who follows in their footsteps, they attest to the pattern of action—undergoing the same trials and tribulations in ever new settings and frameworks in every new installment and starting from a “virtual new beginning” with every episode of their reenactment, as Umberto Eco wrote of Superman (“The Myth of Superman,” 117). These are figures that lend themselves extraordinarily well to the implementation and performance of media changes. They are flat, familiar, and iconic, and they allow the medium that takes them up to foreground its own workings and possibilities in a manner which an unfamiliar storyline or complex character would never permit (Mayer, Serial Fu Manchu). Serial figures are in-between creatures, marking transitional states between elementary conditions, categories, or concepts. And even though many of them stem from the generic territory of gothic or horror, all are at some point or other implemented in and marketed by means of detective or crime plots. This attests to the fact that the serialized and serializing market of popular narration found a particularly fertile ground in the literary genres of detective fiction and crime narration that underwent a dramatic transformation of scope and structure in the second half of the nineteenth century. Where early detective narratives (E. T. A. Hoffmann’s Mademoiselle de Scudery, Edgar Allan Poe’s Dupin tales, or Émile Gaboriau’s stories around inspector Lecoq) zoom in on intriguing phenomena, which are then taken apart by means of ratiocination and systematic probing, analytic precision, and the dazzling performance of intellectual brilliance, the detective stories of the feuilleton and the pulp market reach out and push ahead; they sprawl, spatter, and spread: “Within the feuilleton, the detective’s logical and systematic investigation no longer supplied the armature of narrative development and closure, but simply became one episode in the feuilleton’s ongoing rush of sensations,” writes Tom Gunning in reference to Régis Messac (“Lynx-Eyed Detectives,” 78). With regard to Sherlock Holmes, Michael Chabon identifies an endlessly “looped” logic of folding or “nesting” as the prominent pattern of narration. Chabon interlinks this principle of storytelling very closely with the particular genius of Conan Doyle, but it is at least as consistent with the parameters of the trans-Atlantic periodical market in which Conan Doyle expertly inscribed himself. His stories are tightly coiled, but they also offer innumerable points of departure for other stories—backstories and corrections, revisions and alternative versions, not to mention the fan fictions that still regularly take off from Baker Street many years after Sherlock Holmes’s inception (48). Chabon associates this format of dissemination with the “business of Empire”—with a political and economical logic of expansion that by Conan Doyle’s time had already manifested itself as by no means unidirectional (49). Thus, the spirit of the “imperial Gothic,” of a haunting that spread back to the familiar world from the world “out there” and “overseas,” may well be the longest lasting legacy of turn of the century literature in Europe (Mayer, Serial Fu Manchu, 27–58). It is against this backdrop that the figure of the master criminal (or criminal monster) enters the scene of a serialized mass culture of modernity. The master criminal is a serial criminal, even though the form his criminal activities take tends to thrive on variation rather than the obsessive repetition complex that marks serial criminals from Jack the Ripper to Hannibal Lecter. All of the serial crime stories of the period are in some way or other connected to the Sherlock Holmes plot. But at some point around the turn of the century, it seems, the fascination with criminological plots that inspires the Sherlock Holmes narrative seems to have switched into a much more explicit fascination with the criminal principle and process itself, especially as it manifested itself in the political and economic metropolises of modernity—most importantly Paris, London, and New York. In 1912, Sax Rohmer modeled a series of short stories on the Sherlock Holmes pattern, focusing on the detective figure Sir Nayland Smith as a principle of law and order. But soon his stories were taken over by the epitome of evil, the yellow peril figure Fu Manchu, who would prove so much more popular and intriguing than the detective (Mayer, Serial Fu Manchu). And, almost at the same time, across the channel, “the professional detective gave way to the master criminal of the modern city,” too (Abel, The Ciné Goes to Town, 355). Fantômas—preceded in France by Zigomar, and followed a little later in Germany by Dr. Mabuse—would manifest himself as the most spectacular version of this substitution or shift, lodged somewhere in between the thriller and the horror story. Etienne Rambert, who will turn out to be the first of many cover identities of Fantômas in the novel series, is introduced as “an energetic man who is always moving about” (Souvestre and Allain, Fantômas, 7). His biography seems tightly conjoined with the project of global industrial expansion and exploitation in the early twentieth century: “Although he is quite sixty he still occupies himself with some rubber plantations he possesses in Colombia, and he often goes to America: he thinks no more of the voyage than we do of a trip to Paris” (7–8). The other major cover identity that Fantômas makes use of in the narrative’s first volume, an Englishman by the name of Gurn, is a veteran sergeant of the British army who had served in the Transvaal in the Boer War. At first, thus, Fantômas, too, is associated with the imperial world and its dark underside, with the uncontrollable passions and perversities that the experience of the foreign unleashes. In the further course of the serial narration, Fantômas amasses many more covers and fronts, but only a few of them continue to point to a foreign context or imperial setting. In fact, this theme seems to retreat into the background as the series proceeds. In their sheer multiplicity Fantômas’s identities now seem to suggest the perplexing and disturbing insight that the spirit of the foreign need no longer be introduced to the homeland which has long become strange, unfamiliar, “un-heimlich” in its own right. Even in the first novel it is hard to reconcile the cover stories—how can Fantômas live the life of a plantation owner and big business man and the life of a British soldier at the same time? As sequel follows sequel in quick succession and as the novels’ biographical backstories become increasingly more convoluted, it also becomes obvious that the mesh of fake identities and invented pedigrees that is projected back on Fantômas cannot possibly be sustained by one person, even an incredibly energetic one like Fantômas. It is physically impossible to be at two places at the same time, let alone pursue multiple different lifelines simultaneously. Seen that way, the Fantômas series unfolds what could be called a panorama of alternative possibilities. Robin Walz points out that this logic of parallel seriality affects not only the figure of Fantômas himself, but all of the main protagonists of the series: “the characters in Fantômas are not merely ‘disguised’ as someone else. For the practical purposes of the novel, they actually have to be someone else” (Pulp Surrealism, 58). In this light, the fearful observation that “[s]uch a number of awful murders and crimes are being perpetrated every day that you would think not one, but a dozen Fantômas were at work” captures a paradox at the core of the novels’ narrative logic (Souvestre and Allain, Fantômas, 236). “Mass culture,” writes the sociologist Michael Makropoulos, “is a culture of the ‘sense of possibility.’” Makropoulos draws on Robert Musil’s famous reflections on the modern “sense of possibility” in The Man Without Qualities to point to mass culture’s function as a tool of social engineering. This function relies on the capacity of mass culture to conceptualize contingency, this basic condition of modernity, in terms of an array of options rather than exclusively in terms of alienation and anomie. As the most intriguing expression of this re-semanticizing (and reassuring) move, Makropolous identifies the trend to fictionalize “self- and world-relations” (11). Makropolous goes on to associate the mass cultural “sense of possibility” with the pervasive modernist processes of technization and their “constitutive metaphysics of disposability,” which figure both as the condition and the object of mass cultural communication and expression (11). In this context, the Fantômas novels appear highly self-reflexive: they perform the mass-cultural operation of fictionalization through which options are fanned out and multiple horizons of possibility projected as an open series. The openness and contingency of the modern, urban, mass-cultural configuration is made out as both frightful in its disruptive impact on the individual and exhilarating in its disclosure of endless alternatives. Fantômas’s anarchic agency is deeply immoral, but it is too undirected to figure forth a proto-Fascist fantasy of totality and too random to suggest an aesthetic of the ornamental in Kracauer’s sense. In the fictional universe of the novels and the serial there is no core and no heart, but there is also no desire to subjugate or monopolize. Modern life is shown here as a vast array of optional paths and choices, many of them dangerous, some tempting, which can all be taken: a panorama of possibilities. Due to technical constraints and its media-specific narrative economy, the Feuillade film serial could not copy the novels’ panoramic layout to achieve a similar effect of parallel possibilities. In consequence the serial approaches the spirit of the novels’ meandering, serializing narration and its logic of outbidding metonymically by means of convergences, condensations, or zooms—“playacting in a game of mise-en-abyme,” as Richard Abel puts it (The Ciné Goes to Town, 378). It arguably comes closest to indulging in the pulp literary “sense of possibility” in the much-discussed prologues to three of the five films—when a close-up of René Navarre, “dans le rôle de Fantômas,” as a first intertitle announces, is dissolved into shots showing him in all the roles and disguises adopted by Fantômas in the course of the following film. The prologue of the second serial, Fantômas: Juve contre Fantômas, stands out because it ends with “the ultimate image of Fantômas”—the man in black, pulling his hood over his face—and it is complemented by a second series of shots introducing Edmund Bréon, the actor playing Inspector Juve, in his respective disguises (Gunning, “A Tale of Two Prologues,” 33). These prologues have been largely read in terms of their difference from the narrative regime of the novels—because they lay bare the workings of masquerade and make-believe at the outset, while the novels systematically expose us to the shock of discovery as we read along. But when seen from the vantage point of a modernist and mass cultural “sense of possibility,” the prologues do, in fact, respond in kind to the novels’ poetics of proliferation and spread, offering a cinematic variation of the same pattern rather than a break with its logic. In the critical literature on Feuillade’s Fantômas, the crime serial is routinely correlated formally with the discursive field which feeds the serial’s subject matter: criminology. The criminological methods established by Alphonse Bertillon and implemented in France in the 1880s are in particular invoked as an important context. Tom Gunning was the first to argue that the prologues to the individual installments do not only aim at implementing medially specific techniques of attention management and at familiarizing the spectator with the logic of the cinematic star system. He pointed out that in their display of facial close-ups, the prologues call to mind the criminal archive compiled on the grounds of Bertillonage, based on a meticulous cross-linkage of standardized photographs (“mug shots”) and anthropometrical data, in order to “break the professional criminal’s mastery of disguises, false identities, multiple biographies, and alibis” (fig. 2). The criminal’s made-up identities are countered by Bertillon’s “portrait-parlé”—the standardized description that hones down the individual’s arbitrary appearance to a set of computable and comparable numerical values which speak for themselves more expressively than the crook’s verbose dissimulations and visual pretensions. Fig. 2. Aesthetics of the mug shot. From Fantômas I: A l’ombre de la guillotine. Like serial mass culture, Bertillon’s system of identificatory classification relies on iconization, as in both cases “the multiple signs of the . . . body [are reduced] to a textual shorthand,” as Allan Sekula writes in regard to Bertillon’s system (“The Body,” 56). Moreover, Bertillon’s system resonates with the workings of serial mass culture in several other ways, as it relies on standardization and repetition and as it also substitutes for the notion of individual ingenuity (the detective’s or artist’s) the idea of mechanical engineering (of a team, institution, or apparatus). Sekula thus associates the approach mapped out by Bertillon with the “encyclopedic authority of the archive,” an authority that “tended to relegate the individual photographer to the status of a detail worker, providing fragmentary images for an apparatus beyond his or her control” (“The Body,” 58). In this manner, late nineteenth century criminology—alongside, and at times in conjunction with, serial mass culture—responded to what could be seen as the most threatening dimension of modernity: its fast turnaround of identities and stories, or, as Makropoulos puts it, its contingency. Bertillon’s ingenuity consisted in the recognition that there was no need for an all-pervasive typology to counter the proliferation of intersecting lifelines but that a committing system of description would suffice: “he used anthropometry, not to delineate group identity—races—but for the novel purpose of individualization” (Cole, Suspect Identities, 34). A similar focus on, or perhaps obsession with, individual particularity rather than group identity manifests itself in the Fantômas serial. Fantômas’s reliance on masks and make-up, on disguises and cover identities, seems to run counter to the practice of ignoring or abstracting from “[c]lothing and other clues to a person’s social and local identity, on which laymen focused for the purpose of identification.” But a closer look at the enactment and implementation of masquerade and make-believe in the serial demonstrates that Fantômas responds to the standard criminological practice of identification of its day in a manner that is not so much subversive of Bertillonage, but rather brings criminology medially up-to-date: from the photographic portrait-parlé to the filmic “signifying sequence,” as it were. This comes to the fore in the prologues, when portraits turn into shots that are then superimposed on each other, thus putting appearances into relation and inviting us to first appreciate and then penetrate the layers of make-up and costume to discover the permanent features behind and underneath. Yet the logic of the signifying sequence can be traced more strongly still in the narratives themselves, particularly in their self-conscious references to acts of acting. Thus, in Fantômas I we are most glaringly reminded of the extradiegetic introductory sequence in its criminological appeal when, toward the end of the film, we encounter a diegetic actor by the name of Valgrand, who does what we saw René Navarre do in the beginning: play Fantômas. To be more precise, Valgrand is involved in some kind of second-order performance: he enacts, on stage, the dramatic role of one of Fantômas’s alter egos, the infamous criminal Gurn, who is awaiting his execution in prison at the other end of town. By this time in the film, the audience—in contrast to Valgrand—knows that Gurn is none other than Fantômas, and Fantômas knows how to make use of Valgrand’s acting skills. He lures the actor in costume close to the prison, gets him drugged, smuggled in, and then pulls a characteristic last-minute escape. Valgrand is rescued from being executed in Gurn’s stead only in the nick of time. René Navarre plays Valgrand who plays Gurn who is Fantômas (fig.3). Since the expository sequence of the prologue introduces us to Fantômas’s disguises in the film rather than Navarre’s range of roles, Valgrand’s face does not appear here. Then again, perhaps it does, since the diegetic actor’s beardless and well-groomed smooth face closely resembles the face displayed at the very outset of the prologue as “M. Navarre.” Both actors, the real one and his diegetic replicant, present blank screens on which the props of identity—beards and tousled hair, glasses and crooked noses, wrinkles and scars—are then mounted. More glaringly than the prologue, the Valgrand episode depicts masquerade not so much as an instance of deception, but rather as an accomplishment or talent—focusing on its enactment and application, rather than exclusively displaying its effect. The ultimate performance artist, however, is Fantômas (or Navarre), not Valgrand. Fig. 3. Comparing likeness. From Fantômas I: A l’ombre de la guillotine. In the prologue, Navarre’s face fades filmically into the faces of his roles—the transition is blurred and highlighted at the same time. Valgrand’s transformation from actor to role, however, is considerably less sophisticated and subtle: it can be witnessed on screen.We see Valgrand study a newspaper report and photograph of Gurn to prepare for his role, closely referring back to the photograph as he puts on makeup, a moustache, and a wig. After the show, when he is surrounded by admiring visitors, he takes up the photograph once more in a melodramatic pose—daring his audience to distinguish original and copy. He is saved from the guillotine because Inspecteur Juve notices that he is wearing makeup and proceeds to rip off his wig and moustache—something he never gets to do to Fantômas, who we do not ever see out of costume in this first installment. But then, Fantômas’s makeup never shows. Of course, neither does Navarre’s. This entire description throws into relief the suspicious signs of this man’s fabricated appearance: Features are “laid upon,” they “cover,” they “conceal,” and they “envelop.” The wording of the passage alerts us pointedly to the fact that there is not much to see of the person’s face, that his traits are hidden under several layers of hair. In the context of this thick description, the final reference to the “foreign origin,” ironically, does not suggest a world in which the familiar is threatened by the foreign, but rather portrays the foreign as one other element of masquerade. The passage invites us to imagine all characteristics of social, cultural, and even ethnic distinction as mere superimpositions. “Identity” in the criminological sense, then, comes to the fore only once the person is stripped of all of these superficial marks. What is left is a smooth, nondescript, inconspicuous, unremarkable emptiness, a “nothing” or phantom: Fantômas. The filmic prologue of Fantômas II, which ends with what is both Fantômas’s most basic disguise and the most unreadable of his costumes—the black bodysuit with the cagoule—corresponds neatly with this literary logic of identification. But it is important to note that neither novels nor films stop short at the insight that there is—in a very literal sense—nothing underneath the mask, although this is certainly one message to be gleaned from both series, and a message which may have been at the core of the narratives’ fascination for the artistic avant-garde of the period (Walz, Pulp Surrealism). Both series’ popular appeal, however, most likely owed more to the recognition that there certainly are many interesting masks to look at, complete with a vast array of exotic backstories and fantastic circumstances of use. The novels thus quickly abandon the melodramatic quest for an underlying meaning and significance (“Who is Fantômas?”), and unfold, instead, an endless series of identities and stories in breathless circulation—panoramas of possibilities. The films, too, prove quite uninterested in the game of disclosure and clearance that the first installment vaguely touches upon. Soon we get to see Fantômas unmasked, and he looks exactly like René Navarre at the outset of the prologue. Responding to this exposure, the prologues are abandoned, and the narrative focus moves on to trace the dynamics of masking on a much larger scale of action and effect than first laid out. This logic culminates in the last installment, Fantômas: Le faux magistrat (The False Magistrate)(1914). Indeed, the film takes its time even to get to Fantômas. Unlike the earlier films, this one is largely set in Saint Calais, leaving Paris behind. At the outset of the film we are introduced to what will quickly turn into a crime scene, in an establishing shot that shows two doors, side by side. A priest dressed in cassock and hat exits on the right, before an intertitle cues us in on the focus of attention: “[i]n the room next to the one occupied by the priest . . . .” Of course, at this stage in the narrative, any person whose outfit or appearance stands out—be it priest or bum, bearded magistrate or fat prison inspector—arouses suspicions, so that it does not really come as a surprise when the priest turns out a fraud and his outfit reappears next in the film when it is thrown out of a train after serving its purpose. It may come as a surprise, however, that the person underneath the frock was not Fantômas. In fact, the act of clever criminal plotting at the beginning of the film turns out to have nothing to do with the master criminal, although he knows how to profit from it later on. Fantômas enters this plot much later, after his escape from a prison in Belgium and return to France via England. On his journey back he comes across the magistrate, who is on his way to Saint Calais to investigate the crime, and decides to kill and impersonate him. With his large white beard, youthful face, and darkly made-up eyes, this magistrate looks like an impostor to start with, so that Fantômas can easily take his place (fig. 4). Again, we get to witness the act of imposture: Fantômas pulls out the “nouvelle trousse de maquillage,” which, as the intertitle informs us, he bought in London, and sets out to put his face on, in an scene that echoes the theatre scene of Fantômas I in its operational aesthetics. Fig. 4. Suspicious authenticity. From Fantomas V: Le faux magistrat. At this stage in the serial, the criminological linchpins of identification and detection have largely dropped out of sight. Instead of unveiling criminal acts and agents, the films now seem to be content to merely perform them—presenting a ceaseless slippage of identities, a series of impersonations without substance, provoked by chance encounters and coincidences. Bertillon’s portrait parlé comes to be replaced by such signifying sequences that rehearse processes of transformation, in which identities are shown to be in constant transition, corresponding, resonating, feeding on each other. With this, however, the films move away from the spirit of criminology and take up a different epistemological model of thought, this one very much steeped in twentieth-century media culture: psychotechnics. In the Feuillade Fantômas serial, the Bertillon system, with its emphasis on identification, recognition, and crime control, is referenced but also marked as dated. The world depicted in the serial is a world in which crime cannot be erased. Figuring as one of many indices of social diversity and deviance, crime becomes a basic condition of the modern system, a nuisance that needs to be managed, but cannot be rooted out. In the Feuillade serial, film, as the most modern of representational media, is portrayed as the best means of bringing about such a managerial approach to modernity. This is where psychotechnics, as another prominent discourse of the day, proves key. Where Bertillon’s system responded to the “intensifying desire of communities to apprehend the stranger, the vagrant, and the deviant” by equipping the institutions of surveillance and control with means to identify, detect, and distinguish, psychotechnics aimed at endowing everybody with such distinctive facilities. Bertillon relied on photography and language. Psychotechnics, significantly, turned to film (Cole, Suspect Identities, 49). Psychotechnics evolved as a branch of applied psychology aiming at the optimization of processes of labor and production. In the United States, the term psychotechnics never really caught on, although psychotechnical approaches and methods did have a notable impact on theories of industrial organization and marketing. 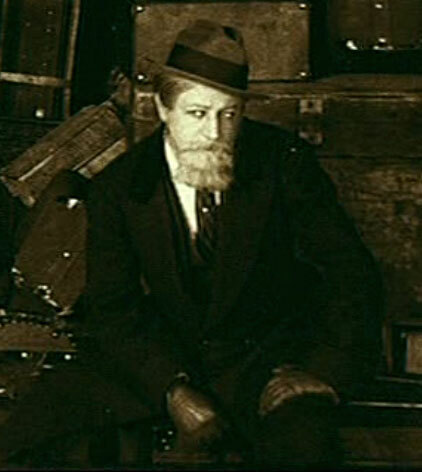 The German-American psychologist and theoretician of film Hugo Munsterberg acted as a prominent propagator of psychotechnics, extolling its potential in his study Psychology and Industrial Efficiency (1913), and then setting out to apply its insights to the medium of film in The Photoplay: A Psychological Study (1916). The methodological arsenal of psychotechnics was quickly moved from the specialized spheres of clinical psychology journals to the broader sphere of intellectual and artistic discourse and finally took over media theory—as exemplified in Munsterberg’s influential work. Robert Musil’s aforementioned reflections on the “sense of possibility” unfold against the backdrop of psychotechnical theorizing, as do large parts of the debates of the period on media of representation and communication, and on the optimization of processes of labor and production. In the broader sense, psychotechnics expounds a doctrine of organization and management that responds to the processes of proliferation, distraction, and dispersal characterizing modernity not by trying to eliminate contingency, but by trying to habituate the individual to these conditions. Technical media play an immensely important role in this context, both in their function as means of recording reality and as tools to process reality’s complexity without engaging in reduction and abstraction. This is what Munsterberg found so fascinating about the new format of the “photoplay”: “There is no limit to the number of threads which may be interwoven,” he enthused about the medium’s possibilities. The apparatuses of mass-cultural entertainment—most importantly the cinema—were of interest to Munsterberg because of their potential to prepare people for the requirements of modernity in all of its complexity. Munsterberg did not write about film serials, but his understanding of film corresponds neatly with the focus of serial studies. He saw film as a mode of panoramic representation—unfolding endless variations of possibilities—and distinguishes cinema’s “spatial” logic of spread from earlier, temporally bound formats of narration: “The temporal element has disappeared, the one action irradiates in all directions” (Munsterberg, “The Photoplay,” 105). Stefan Rieger points out that psychotechnical theories led to a valorization of short cultural forms which rely on fast sequences, rhythmic forms of presentation, and recognizable and replicable formats (Rieger mentions the aesthetics of the vaudeville show or early film, but one could also think of magazine short stories or dime novels) as opposed to the modes of the total, the large-scale, and the monumental that came to be increasingly associated with an elitist and detached high cultural sphere (Die Individualität der Medien, 127–42). Obviously, this preference for small and fast forms is perfectly compatible with serial formats. The film serial, especially in its early stages of development, relies heavily on narrative “modules” to establish serial coherence and continuity and to manage the audience’s serial memory. Such modules include not only individual installments and episodes, but also recurring plot patterns, character constellations, or scenarios. In the Fantômas serial, the prologues to the first three films need to be seen in this context—as modular points in the organization of the narrative’s overall unfolding, or better, fanning out. The prologues serve to provide orientation at the outset, but they are also referenced repeatedly in the films in order to tether the diverse strands of narration to an increasingly tenuous narrative frame, to ensure minimal coherence in a narrative that is based on the principles of dispersal and ramification. These references to the temporal parallelism of action resonate with the even more powerful visual evidence of spatial parallelism throughout the serial. It has been often pointed out that while D. W. Griffith busily explored the narrative possibilities of editing in the United States, Feuillade, like other European directors, continued to rely on the panoramic mode of presentation, using tableaux in static long takes rather than quick successions of shots to enact his narrative. Feuillade’s strangely depthless characters are enacted in settings that stretch out spatially beyond the limits of ordinary vision, layered into intricate spheres of foreground, middle ground(s), and background. David Bordwell has rightly argued that such deep staging need not have an effect of disorientation or disjunction, as long as intricate strategies of staging and attention management direct the spectator’s navigation through the shot (“La Nouvelle Mission de Feuillade,” 12). As one example of such a skillful organization of space, Bordwell discusses the theatre scene in Fantômas I, which presents in one frame Valgrand’s tiny figure on a scene in the background, bowing to the theatrical audience as he makes his exit, and the looming figure of Lady Beltham, the woman who acts as the instrument of Fantômas’s sinister scheme, in the extreme foreground, overlooking the scene from her box (fig. 5). Lady Beltham turns away from the diegetic center of attention, the stage, as the sequence unfolds, moving toward the camera instead—and thus presents herself to the real audience of interest in this scene, the cinematic audience. Here and elsewhere, Bordwell concludes, manipulations of size within the frame in addition to “differences of tonality, overall composition, movement, character glance, and informative features of human bodies (such as faces, eyes and hands)” serve to steer and guide the audience’s attention and to facilitate their journey through the film’s narrative universe. We do not know everything that is going to happen, but we clearly know much more than the film’s diegetic audience, the theatregoers who are focusing on the wrong site of action and see only bits and pieces of what is really going on (11). Fig. 5. The real audience. From Fantômas I: A l’ombre de la guillotine. These strategies of attention management remain operative throughout the serial. I argue that this technique predominates even in scenes where the tableau arrangement seems to foster an atmosphere of disorientation or vertigo. 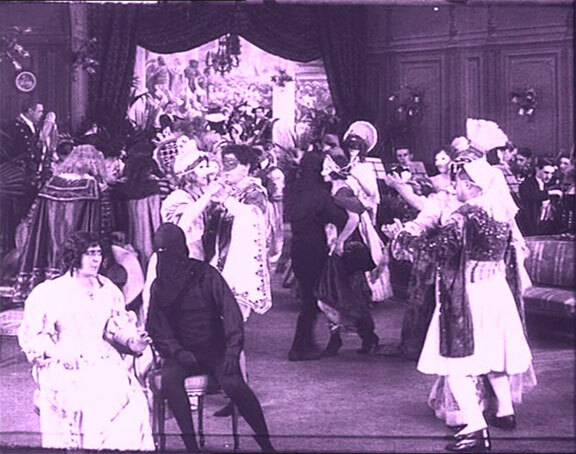 One often-referenced instance is the scene of a masked ball in Fantômas: Fantômas contre Fantômas (Fantômas vs. Fantômas) (1914), where the ballroom is presented in a single long shot organized through deep staging. Three men disguised as Fantômas appear at the ball, one of them the real villain, and all three can be seen in the crowd alternately throughout the scene (fig. 6). Clearly the scene is meant to relate “the confusions of identities that lurk beneath the playful multiplication of men in black,” as Tom Gunning contends (“Lynx-Eyed Detectives,” 86). But at the same time, the confusion is held at bay through the panoramic presentation of all three Fantômases in action: we do not know who’s who in this scene, but we do know that they are there and who originally dressed up in this guise—and again this is much more than the people at the ball can possibly know at this moment in time. With regard to the American film historical reconfigurations of the mid- to late 1910s, Miriam Hansen points out that cinematic modes of audience address and the representation of social reality on screen have always been complicatedly convoluted, but that the parameters and functions of their conjunction change over time. The films of the transitional period thus fashion their ideal audience as detached, sophisticated, and media-savvy. The films proceed by inviting their cinematic audiences to define themselves in sharp distinction from the people—the assemblies, the crowds, the masses, also the audiences—depicted on the screen. The screen may act as a mirror screen when it comes to singular constellations—love plots and conflicts of desire—but as soon as large groups of people are involved, identification tends to give way to critical reflection, nostalgic projection, or distanced observation—modes of reception that all rely on the awareness that the spectator is not part of what is happening on screen. Fig. 6. The perfect costume. From Fantômas III: Fantômas contre Fantômas. This disjunction that complicates moments of apparent self-reflection in film is often exemplarily marked by the representation of theatrical audiences in film, but it is by no means exclusive to such pertinent moments of apparent self-reflection. When the French sociologist Gabriel Tarde distinguished in 1898 between the constellations of “the public” (le public) and “the crowd” (la follie), he took note of a dynamics of dissociation very similar to the one informing the regiment of film audience address a decade later. Tarde presents crowds as physical, present, and real entities—masses of people that meet in a concrete space, visibly and tangibly. Publics by contrast are made, dispersed, mediated—imagined, as Benedict Anderson would call the very same phenomenon much later. Tarde attributes the public’s coherence to the power of print, which was later reinforced and propelled by the “mutually auxiliary inventions” of the railroad and the telegraph, to forge a sense of community in the absence of physical or visual contact. It did not take long for psychologists like Munsterberg or Hermann Duenschmann to recognize the obvious affinities of Tarde’s concept of the public to the film audience. Film, with “its possibility of mechanical reproduction” could forge innumerable parallel publics, or audiences, and allow for all sorts of scenarios of manipulation or education, at best providing a vast array of different audiences simultaneously with the possibility to adjust and respond to the exigencies of modernity. In the Fantômas serial this distinction between “crowds” and “publics” (or “masses” and “audiences”) seems to be most important. Fantômas may manipulate the masses in the film, but the audience of the film is being trained to see through his ruses—to be thrilled and entertained but also to enjoy its own superior understanding and vantage point vis-à-vis the duped victims. Contingency is made manageable in the process, laid out as a series of options rather than a threatening maze. Fantômas’s world is not an epical narrative, and the spectator—or reader—of this world should not even try to pull all of its threads of parallel action back together into one fabric. Instead, the addressees of both the written and the screened Fantômas are invited to conjecture and interlink, to recognize and to compare, to detect correspondences and to draw conclusions, not in order to come to a larger underlying truth, but to keep abreast of the troubled waves of modernity without being pulled under. This paper is part of a larger project on silent and sound film serials conducted jointly with Ilka Brasch in the context of the research unit “Popular Seriality—Aesthetics and Practice” (director: Frank Kelleter, Free University Berlin). Many thanks to Ilka Brasch for inspiration, help, and corrections. Thanks also to the diligent reviewers of Modernism/modernity. ^ Pierre Souvestre and Marcel Allain, Fantômas (1914), trans. Cranstoun Metcalfe (New York: Dover Publications, 2006). ^ Robin Walz, Pulp Surrealism: Insolent Popular Culture in Early Twentieth-Century Paris (Berkeley: University of California Press, 2000), 42–58; Tom Gunning, “A Tale of Two Prologues: Actors and Roles, Detectives and Disguises in Fantômas, Film and Novel,” Velvet Light Trap 37, no. 3 (1996): 30; Vicki Callahan, Zones of Anxiety: Movement, Musidora, and the Crime Serials of Louis Feuillade (Detroit: Wayne State University Press, 2005), 50. ^ Pierre Souvestre and Marcel Allain, Fantômas (Paris: Fayard, 1911), 1:1. ^ Fantômas: A l’ombre de la guillotine (In the Shadow of the Guillotine), directed by Louis Feuillade (1913; in Fantômas: Louis Feuillade’s Classic Serial, disc 1, Cinemateque Française: 1998), DVD. Henceforth Fantômas I. ^ Rae Beth Gordon, Why the French Love Jerry Lewis: From Cabaret to Early Cinema (Stanford: Stanford University Press, 2001), 127–66; see also Jeffrey Sconce, Haunted Media: Electronic Presence from Telegraphy to Television (Durham: Duke University Press, 2000); Stefan Andriopoulos, Possessed: Hypnotic Crimes, Corporate Fiction, and the Invention of Cinema (Chicago: University of Chicago Press, 2008); Tom Ruffles, Ghost Images: Cinema of the Afterlife (Jefferson, NC: McFarland, 2004). ^ Monica Dall’Asta, ed., Fantômas: La vita plurale di un antieroe (Pozzuolo del Friuli: Il Principe Constante, 2004). ^ Umberto Eco, “The Myth of Superman” (1972), in The Role of the Reader: Explorations in the Semiotics of Texts (Bloomington: Indiana University Press, 1979), 107–24; Richard Abel, “The Thrills of Grande Peur: Crime Series and Serials in the Belle Epoque,” The Velvet Light Trap 37, no. 3 (1996): 3–9; Roger Hagedorn, “Technology and Economic Exploitation: The Serial as a Form of Narrative Presentation,” Wide Angle 10, no. 4 (1988): 4–12; Ben Singer, Melodrama and Modernity: Early Sensational Cinema and its Contexts (New York: Columbia University Press, 2001); Ruth Mayer, Serial Fu Manchu: The Chinese Supervillain and the Spread of Yellow Peril Ideology (Philadelphia: Temple University Press, 2013). ^ Loïs Artiaga and Matthieu Letourneux, Fantômas! Biographie d’un criminel imaginaire (Paris: Les Prairies ordinaires, 2013), 63–67. ^ Frank Kelleter, “Populäre Serialität: Eine Einleitung,” in Populäre Serialität: Narration—Evolution—Distinktion. Zum seriellen Erzählen seit dem 19. Jahrhundert, ed. Frank Kelleter (Bielefeld: Transcript, 2012), 11–48. ^ Patrice Caillot Alfu, François Ducos, and Gino Starace, L’illustrateur de “Fantômas” (Paris: Encrage, 1987). ^ Annie Renonciat, “Arthème Fayard’s Magazines and the Promotion of Picture Stories ‘à la française,’” European Comic Art 1, no. 2 (2008): 145. ^ Francis Lacassin, Maître des lions et des vampires, Louis Feuillade (Paris: Bordas, 1995); David Bordwell, “La Nouvelle Mission de Feuillade; or, What Was Mise-en-Scène?,” The Velvet Light Trap 37, no. 3 (1996): 10–29. ^ René Navarre, Fantômas c’etait moi: Souvenirs du créateur de Fantômas en 1913 (Paris: L’Harmattan, 2012). ^ Sean Axmaker, “Louis Feuillade: An Introduction,” Keyframe, November 4, 2013, fandor.com/keyframe/louis-feuillade-an-introduction. ^ Richard Abel, The Ciné Goes to Town: French Cinema 1896–1914, rev. ed. (Berkeley: University of California Press, 1998), 377. ^ Frederico Pagello, “Transnational Fantômas: The Influence of Feuillade’s Series on International Cinema during the 1910s,” Belphégor 11, no. 1 (2013): belphegor.revues.org/125; Artiaga and Letourneux, Fantômas! ^ David White, Fantômas in America (Encino: Black Coat Press, 2007). ^ Rudmer Canjels, Distributing Silent Film Serials: Local Practices, Changing Forms, Cultural Transformation (New York: Routledge, 2011), 16; see also Sarah Delahousse, “Reimagining the Criminal: The Marketing of Louis Feuillade’s Fantômas and Les Vampires in the United States,” Studies in French Cinema 14, no. 1 (2014): 5–18. ^ David White, “Fantomas 1921—A Tale of a Lost American Movie Serial,” Belphégor 11, no. 1 (2013): belphegor.revues.org/194. ^ On definitory debates regarding the format of the film serial in general, and the Feuillade Fantômas in this context, see Singer, Melodrama and Modernity; Shelley Streeby, American Sensations: Class, Empire, and the Production of Popular Culture (Berkeley: University of California Press, 2002); Callahan, Zones of Anxiety; Canjels, Distributing Silent Film Serials. ^ See also Francis Lacassin, “The Éclair Film Company and European Popular Literature from 1908 to 1919,” Griffithiana 47 (1993): 61–87; Matthieu Letourneux, “Des feuilletons aux collections populaires: Fantômas, entre modernité et héritages sériels,” Belphégor 11, no. 1 (2013): belphegor.revues.org/286. ^ See also Jane Gaines, “Superman and the Protective Strength of the Trademark,” in Logics of Television: Essays in Cultural Criticism, ed. Patricia Mellencamp (Bloomington: Indiana University Press, 1990), 173–92, 178–79. ^ Shane Denson and Ruth Mayer, “Grenzgänger: Serielle Figuren im Medienwechsel,” in Populäre Serialität: Narration-Evolution-Distinktion: Zum seriellen Erzählen seit dem 19. Jahrhundert, ed. Frank Kelleter (Bielefeld: Transcript, 2012), 185–203; Ruth Mayer, “Die Logik der Serie: Fu Manchu, Fantômas und die serielle Produktion ideologischen Wissens,” Pop. Kultur und Kritik 1, no. 1 (2012): 136–54. ^ Michael Chabon, “Fan Fictions: On Sherlock Holmes,” in Maps and Legends: Reading and Writing along the Borderlands (San Francisco: McSweeney’s, 2008), 35–57, 47. ^ Patrick Brantlinger, Rule of Darkness: British Literature and Imperialism, 1830–1914 (Ithaca: Cornell University Press, 1988), 227–54. ^ Mark Seltzer, Serial Killers: Death and Life in America’s Wound Culture (New York: Routledge, 1998). ^ Michael Makropoulos, Theorie der Massenkultur (München: Fink, 2008), 10. My translation. ^ See also Tom Gunning, “The Intertextuality of Early Cinema: A Prologue to Fantômas,” in A Companion to Literature and Film, ed. Robert Stam and Alessandra Raengo (Oxford: Blackwell, 2006), 127–43. ^ Fantômas: Juve contre Fantômas (Juve vs. Fantômas), directed by Louis Feuillade (1913; in Fantômas: Louis Feuillade’s Classic Serial, disc 1, Cinemateque Française: 1998), DVD. Henceforth Fantômas II. ^ Gunning, “Lynx-Eyed Detectives,” 81. ^ Allan Sekula, “The Body and the Archive,” October 39 (1986): 27; see also Simon A. Cole, Suspect Identities: A History of Fingerprinting and Criminal Identification (Cambridge, MA: Harvard University Press, 2001); John Torpey, The Invention of the Passport: Surveillance, Citizenship, and the State (Cambridge: Cambridge University Press, 2000). On detective fiction, identifictory policies, and Fantômas see Tom Gunning, “Tracing the Individual Body: Photography, Detectives, Early Cinema and the Body of Modernity,” in Cinema and the Invention of Modern Life, ed. Leo Charney and Vanessa R. Schwartz (Berkeley: University of California Press, 1996), 15–45; Callahan, Zones of Anxiety, 53–55; Emma Bielecki, “Fantômas’s Shifting Identities: From Books to Screen,” Studies in French Cinema 13, no. 1 (2013): 3–15. ^ Kerstin Brandes, “‘Jede Photographie von Personen ist gemacht, um dieselben darauf wieder zu erkennen’: Das fotografische Porträt und die Idee der Identifizierbarkeit,” Serialität: Reihen und Netze: Thealit-Laboratorium vom 31.10.–11.12.1999, thealit.de/lab/serialitaet/teil/brandes/brandes1.html; Jens Schröter, “Archiv—post/fotografisch,” Medien Kunst Netz, 2004, medienkunstnetz.de/themen/fotobyte/archiv_post_fotografisch. ^ Peter Becker, “The Standardized Gaze: The Standardization of the Search Warrant in Nineteenth-Century Germany,” in Documenting Individual Identity: The Development of State Practices in the Modern World, ed. Jane Caplan and John Torpey, 139–63 (Princeton: Princeton University Press, 2001), 151. ^ I thus disagree with Callahan’s Zones of Anxiety (53-55) and Bielecki’s “Fantômas’s Shifting Identities” readings of the Fantômas in terms of a subversion of Bertillon’s methods. ^ Ilka Brasch, “Facilitating Media Change: The Operational Aesthetic as a Receptive Mode,” (presentation at the Imagining Media Change conference, Hannover, Germany, June 2013). ^ Fantômas: Le faux magistrat (The False Magistrate), directed by Louis Feuillade (1914; in Fantômas: Louis Feuillade’s Classic Serial, disc 2, Cinemateque Française: 1998), DVD. Henceforth Fantômas V.
^ See Brasch, “Facilitating Media Change,” and Ilka Brasch, “Narrative, Technology, and the Operational Aesthetic in Film Serials of the 1910s,” Literatur in Wissenschaft und Unterricht 47, no 1–2 (2014): 11–24. ^ See also Torpey, The Invention of the Passport. ^ Stefan Rieger, Die Individualität der Medien: Eine Geschichte der Wissenschaften vom Menschen (Frankfurt am Main: Suhrkamp, 2001); Nicolas Pethes, Spektakuläre Experimente: Allianzen zwischen Massenmedien und Sozialpsychologie im 20. Jahrhundert (Weimar: VDG, 2004); Marcus Krause and Nicolas Pethes, ed., Mr. Münsterberg und Dr. Hyde: Zur Filmgeschichte des Menschenexperiments (Bielefeld: Transcript, 2007); Margarete Vöhringer, Avantgarde und Psychotechnik: Wissenschaft, Kunst und Technik der Wahrnehmungsexperimente in der frühen Sowjetunion (Göttingen: Wallstein, 2007). ^ Hugo Munsterberg, The Photoplay: A Psychological Study (New York: D. Appleton and Company, 1916), 105. ^ See also Rieger, Die Individualität der Medien, 129–31; Shane Denson, “Between Technology and Art: Functions of Film in Transitional-Era Cinema,” in Funktionen von Kunst, ed. Daniel Martin Feige, Tilmann Köppe, and Gesa zur Nieden (Frankfurt/Main: Peter Lang, 2009), 127–42. ^ Daniel Gercke, “On the Eve of Distraction: Gaumont’s Fantômas, 1913–1914,” Sites: The Journal of Twentieth-Century / Contemporary French Studies 1, no 1 (1997): 164. ^ Fantômas: Fantômas contre Fantômas (Fantômas vs. Fantômas), directed by Louis Feuillade (1914; in Fantômas: Louis Feuillade’s Classic Serial, disc 2, Cinemateque Française: 1998), DVD. Henceforth Fantômas III. ^ Miriam Hansen, Babel and Babylon: Spectatorship in American Silent Film (Cambridge, MA: Harvard University Press, 1991), 60–89. ^ Gabriel Tarde, “The Public and the Crowd” (1898), in On Communication and Social Influence: Selected Papers, ed. Terry N. Clark (Chicago: The University of Chicago Press, 1969), 277–94, 281. ^ Hermann Duenschmann, quoted in Michael Gamper, “Massenkultur: Ein interatlantisches Projekt,” in Transatlantische Verwerfungen—Transatlantische Verdichtungen: Kulturtransfer in Literatur und Wissenschaft, 1945–1989, ed. Georg Gerber, Robert Leucht, and Karl Wagner (Göttingen: Wallstein, 2012), 323–47, 331. Ruth Mayer holds the Chair of American Studies at Leibniz University in Hannover, Germany. Her most recent book publication is Serial Fu Manchu: The Chinese Super-Villain and the Spread of Yellow Peril Ideology (Temple University Press, 2014). She is a member of the research unit "Popular Seriality: Aesthetics and Practice" (Berlin-Hannover-Göttingen), where she is currently directing a project on the cultural productivity of film serials from 1910 to 1940.